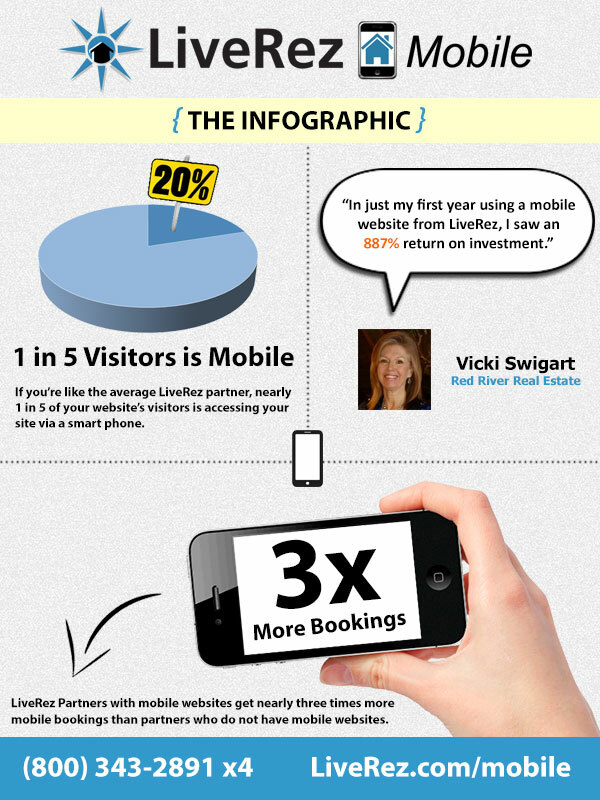 LiveRez recently released an infographic detailing the need for mobile websites and outlining the success its partners are having after launching mobile versions of their respective websites. The infographic (included below) shows that on average about 20% of the traffic LiveRez partners are getting is coming from smart phones. It also shows that, on average, partners with mobile versions of their websites are getting nearly three times more mobile bookings than partners that do not have a mobile website. One LiveRez partner, Vicki Swigart of Red River Real Estate, calculated her first-year return on investment at nearly 900 percent. And the exciting thing about these booking numbers is that they only account for bookings that were completed on mobile devices. The numbers don’t account for bookings where travelers did their initial research on their mobile device and then completed their booking over the phone or from a laptop or desktop. That process is much harder to track. But, if you could quantify those additional bookings, the numbers would likely be even more impressive. To learn more about LiveRez mobile websites, visit LiveRez.com/mobile or call us at (800) 343-2891.